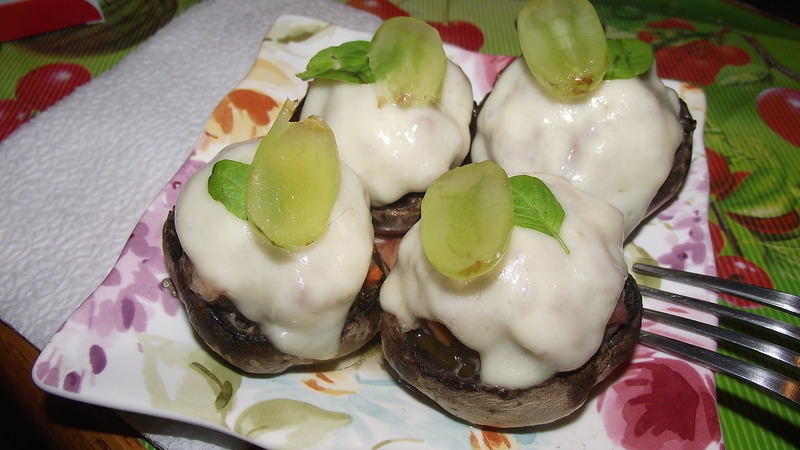 Home » Recipes » Button Mushrooms stuffed with minced meat with lemon basil and grapes. This recipe is really amazing and fast to cook, considering the fact that button mushrooms contain 17 different vitamins, the benefits from this dish increase dramatically. 2 pieces of provolone sliced cheese. Step 1: Take the button mushrooms stalks away. Clean the mushroom from the inside peel the skin (optional), wash carefully. Step 2: Chop the onion, mix with minced pork and seson very well. Step 3: Take the washedbutton mushroom caps, put them near you, form the meatball out of the meat, put the meatball inside the button mushtoom cap. Step4: Repeat with all 8 mushroom caps, set on a baking dish and set to bake at 350F for 17 minutes. Step 5: While the mushrooms are baking take the cheese slices cut them in quarters and set aside. Take the seedless grapes, cut it in slices and set aside. Wash the lemon basil leaves. Step 6: In 17 minutes take your button mushrooms out of the oven, sover with cheese and set to bake for 3 more minutes. 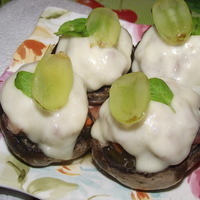 Step 7: In 3 minutes, take the mushrooms out and decorate with sliced grapes and lemon basil. Healthy and Easy Vegan beet salad with prunes! Puff pastry dough made easy!